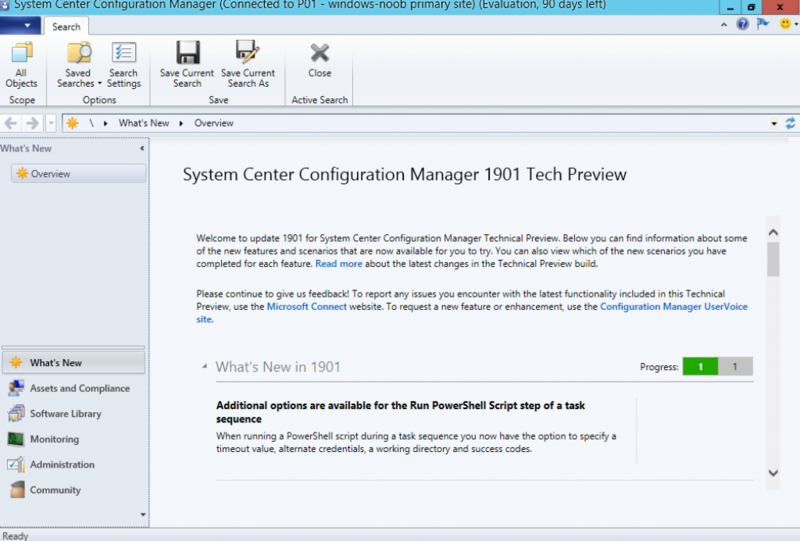 System Center Configuration Manager Technical Preview version 1901 is now available | just another windows noob ? New year, new technical preview release !, the first of 2019 and it’s available for download now. You deploy software updates and other apps to help secure your environment, but these deployments only reach healthy clients. Unhealthy Configuration Manager clients adversely effect overall compliance. Determining client health can be challenging depending upon the denominator: how many total devices should be in your scope of management? For example, if you discover all systems from Active Directory, even if some of those records are for retired machines, this process increases your denominator. At the top of the dashboard, there’s a set of filters to adjust the data displayed in the dashboard. This tile shows the overall client health in your hierarchy. Adjust the priority with which clients install a feature update through Windows 10 servicing. By default, clients now install feature updates with higher processing priority. Phased deployments now have their own dedicated monitoring node. This node makes it easier to identify phased deployments that you created and then navigate to the phased deployment monitoring view. Configuration Manager now supports running CMPivot from the central administration site in a hierarchy. The product lifecycle dashboard now includes information for installed versions of Office 2003 through Office 2016. Data shows up after the site runs the lifecycle summarization task, which is every 24 hours. Management insights has new rules with recommendations on managing collections. Use these insights to simplify management and improve performance. Based on your UserVoice feedback, you can now search for a MAC address in a device view of the Configuration Manager console. This property is useful for OS deployment administrators while troubleshooting PXE-based deployments. You can now set a distribution point in maintenance mode. Enable maintenance mode when you’re installing software updates, or making hardware changes to the server. When you apply software updates to an OS image, there’s a new option to optimize the output by removing any superseded updates. The optimization to offline servicing only applies to images with a single index. This feature is based on your UserVoice feedback. Starting in Configuration Manager current branch version 1810, the classic service deployment in Azure is deprecated for use in Configuration Manager. That version is the last to support creation of these Azure deployments. When you send feedback in the Configuration Manager console, it now shows a confirmation message. This message includes a Feedback ID, which you can give to Microsoft as a tracking identifier. Automatically create and configure virtual machines in Microsoft Azure with Configuration Manager technical preview branch. It uses Azure templates to simplify and automate the creation of a lab using Azure resources. Based on your UserVoice feedback, you can now view the most recent connections for the Configuration Manager console. The view includes active connections and those that recently connected. Configuration Manager can now stop a cloud management gateway (CMG) service when the total data transfer goes over your limit. The CMG has always had alerts, to trigger notifications when the usage reached warning or critical levels. To help reduce any unexpected Azure costs because of a spike in usage, this new option turns off the cloud service. 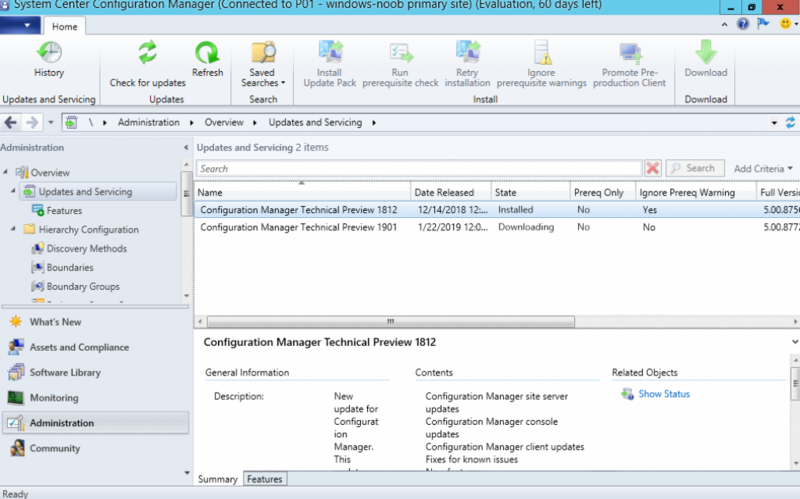 During an OS deployment task sequence, Configuration Manager places the client in provisioning mode. In this state, the client doesn’t process policy from the site. This behavior allows the task sequence to run without risk of additional deployments running on the client. When the task sequence completes, either success or handled failure, it exits client provisioning mode. Based on your UserVoice feedback, there’s a new View action on task sequences. Based on your UserVoice feedback, the task sequence error dialog window now displays more information. It shows the name of the task sequence step that failed. When you set the OSDDoNotLogCommand task sequence variable to true, now it also hides the command line from the Run Command Line step in the log file. It previously only masked the program name from the Install Package step in smsts.log. Set the DWord value DoNotListenOnDhcpPort to 1 in the following registry key: HKLM\Software\Microsoft\SMS\DP. Set DHCP option 60 to PXEClient. Restart the SCCMPXE and DHCP services on the server.